Two boys in rural Tennessee are going to prom together and they’re sharing their story with the world. 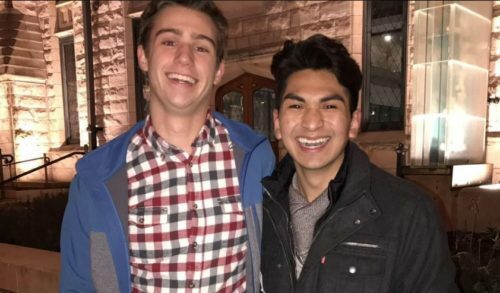 Pedro Reyes and Evan McKenna are from Morristown, Tennessee. Evan would take a while to come around, though, since he wouldn’t come out for two more years. When Pedro was a sophomore, though, he and Evan went out to eat. “We stayed there about three hours just talking about our lives,” Pedro wrote at OutSports. Now they’re going to prom together. Evan, who is at the University of Notre Dame in Indiana, will be flying down next month for the dance. Pedro said that when they went to get boutonnieres, the person working at the flower shop asked, “What color will your dates be wearing?” When they said that they were each other’s dates, the worker didn’t skip a beat and helped them. A local gay photographer overheard the conversation and offered to take their prom pictures. “I vividly remember the confused looks bystanders gave as we posed as a couple,” Pedro wrote. In 2017, the boys got involved in a local fight over marriage equality. The local county commission was considering a purely symbolic resolution to ban marriage equality. Evan, who was newly out, addressed the hundreds of people at the meeting. “Growing up gay in Hamblen County, I have become very skilled at hiding, but I am no longer afraid of embracing my identity,” he said. The measure was rejected by the commission. Pedro will be graduating this year and plans to attend the University of Alabama.